Main Street is beginning to feel some relief, though, according to the Reuters/University of Michigan preliminary reading of consumer sentiment for September, released Friday. The index rose to 70.2 in September from to 65.7 in August, the first increase since June. 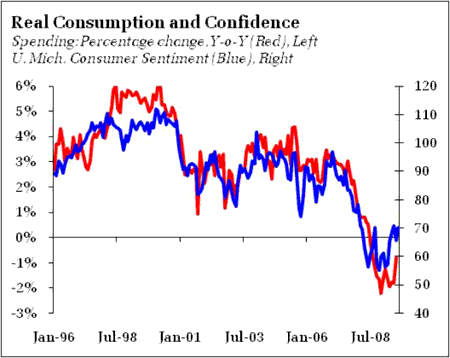 Consumers felt better about current conditions, and about the future. 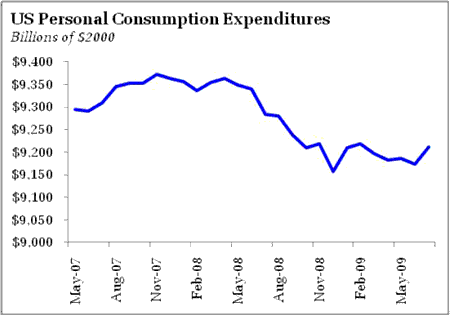 Beyond that, your forecast for aggregate spending is largely base on your view of a.) jobless recovery or not, b.) the direction of saving rates, and c.) the accessibility of credit in the post-bubble era. 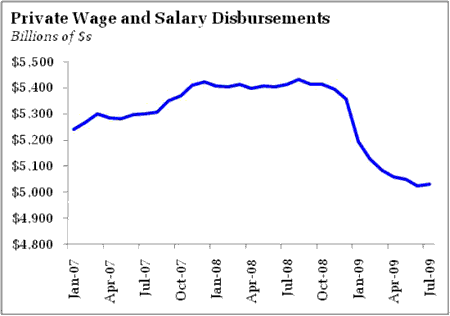 Note that the latter alone suggests persistent downward pressure on spending. 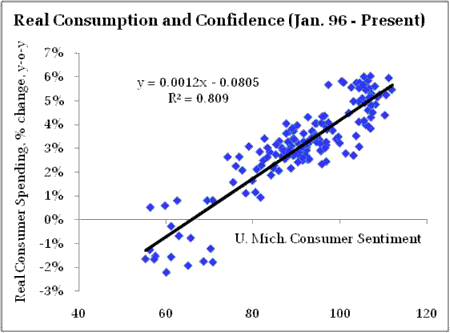 Returning to the rates of spending growth (and, by association, the confidence numbers) of the pre-Great Recession period looks to be unlikely. 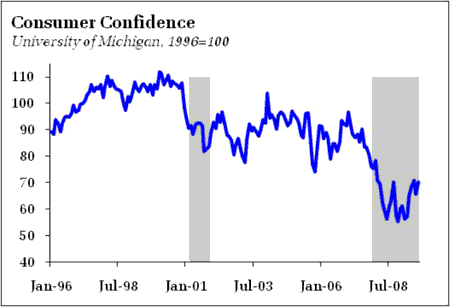 In short, the August “rebound” in confidence isn’t much of a rebound – the rebound happened in April. That said, slowing “improving” labor market conditions argue for a continuing gains in confidence in the months ahead, but I would expect the gains will continue to come slowly. This is extremely significant because I think that people’s attitudes are the thing that needs to change first for us to get out of this recession. People need to feel confident that things are going to improve, and thus start taking what can be amounted to “financial chances” that will help spur our economy out of this hole. People need to have confidence in the stock market so that they start investing. People need to regain confidence in the housing market so that they aren’t scared to buy a home. These are the types of attitudes that will cause things to get better. Its not going to be an instant thing, but I’m glad for some good news finally that we’re headed in the right direction. Once confidence gets up than that seed will be planted in the mind about thinking about going out and spending some money. From there the natural course of action will ensue.